We have a zero tolerance of the use and possession of illicit substances. There will be a heavy security presence at Summer Dance, anyone who is apprehended for any misconduct will be denied entry or removed from the event and face possible criminal charges. Their second release in February 2018, was the hugely popular ‘Club Orange EP’. All three cuts were premiered by leading publications including Mixmag and Resident Advisor. The EP sold out on vinyl in one day, hit the charts on Beatport, Decks.de, and was featured in many leading playlists on Itunes and Spotify; with both Mixmag and Red Bull backing the duo. ‘Space Dub’ also made it ont Maceo Plex’s fabric 98 Mix. Frank Booker has quietly built a worldwide reputation for incredible edits and amazing DJ sets. His work for labels like Wonderful Noise, Sleazy Beats and Disco Deviance sells out on vinyl instantly, and he has recently launched his own vinyl only imprint, Down In The Basement. First signed to boutique London record label Untracked Recordings in 2009, the Auckland based DJ & producer released the ‘Brothers EP’ followed by the ‘Get On’ EP. Booker delved further in 2011 with the release of a pair of records for Japanese imprint Wonderful Noise: ‘El Salvador’ & ‘Tell Them’ (with remixes from Mark E, Kez YM & Cosmic Boogie), which both became instant bestsellers & bombs for discerning dancefloors worldwide. Booker was also the co-host of the highly acclaimed ‘Hit It & Quit It’ radio show alongside the legendary Recloose. Hosted weekly on George.fm for 5 years, the show became one of the station’s most popular and featured many guests including the likes of J Rocc, Jazzy Jay, Nathan Haines. As a DJ, Frank Booker has played alongside Moodymann, Francois K, Tiger & Woods, Bill Brewster, Dam Funk, Kon, DJ Day, Trus’me, Kid Sublime, Rich Medina, Max Graef and many more. His taste spans from deepest disco to 80’s boogie and cutting edge house music, as well as some super special re-edits all put together with a focus firmly on the dancers. Keep on! From the dusty crates of Sydney’s record stores comes Merph, a genuinely passionate and sound record selector. Specialising in a unique blend of crazy-hazy-deep-jazzy house music, Merph plays regularly on the local club circuit and is a go to for the tough task of dancefloor warming. A friend of yours and a friend of ours - Modern Fairytale is your modern fantasy. Over the years we've seen him perform memorable sets at everywhere from Fredas to Laneway and we're positive that his Summer Dance debut will be another dream for your memory bank. Make sure you've got a charged battery because the auto shazam is staying on for his hour of power. 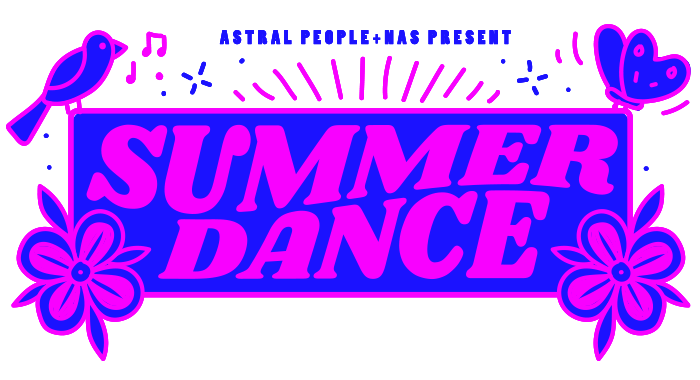 After three sold out events over the past few months, Astral People are gearing up to close out their most successful series to date, announcing their final line-up for the outdoor party staple, Summer Dance. Taking up residence at Sydney’s National Art School on Sunday, March 24. The final instalment has yet again pulled a stellar line-up of artists, welcoming Ireland-via-Berlin legends Brame & Hamo, disco selector Frank Booker & movement connoisseur, Lex Deluxe to soundtrack your Sunday session. Hailing originally from Sligo in Ireland and now based in Berlin, Summer Dance welcomes Brame & Hamo to take us home for the final session of the series. Premiered by Mixmag, their debut EP Trants delved deep into the world of jacking Chicago rhythm, retro-futurist haze and early bleep techno, gaining acclaim on dance floors worldwide thanks to international tastemakers Eats Everything, Sasha, Kornel Kovacs, Leftfield, and Jeremy Underground. Their broad and instinctive understanding of electronic music can be heard in their hugely popular Club Orange EP & mixes across AVA Festival Boiler Room ,Worldwide FM Feel My Bicep and Rinse FM appearance. The cult followed duo will bring their arsenal of dance ready tracks to the grounds of National Art School for a party to remember. Hopping the pond to join Brame & Hamo for one last dance into the sunset is none other than NZ dance guru, DJ & producer Frank Booker. Emerging from the shadows at the beginning of 2009, he was signed to boutique London record label Untracked Recordings where he released his Brothers EP, followed by the Paper Cuts EP. Not only a DJ, Booker was also the co-host of George FM’s highly acclaimed "Hit It & Quit It" radio show alongside the legendary Recloose, featuring many guests including the likes of J Rocc, Jazzy Jay&Nathan Haines. Over the past decade he has played alongside some of the biggest names in the game, rubbing shoulders with the likes of Moodymann, Francois K, Max Graef & more. With a deep knowledge and refined taste for music spanning from deep disco, to 80's boogie and quality modern house, Booker is sure to deliver a set with a focus firmly on the dance floor legends of Summer Dance #4. Rounding out the line-up is the genre defying, party starter Lex Deluxe. Drawing inspiration from artists far and wide, Lex seamlessly travels from genre to genre without breaking the groove, fuelling her set with everything from Optimo to Todd Terje, Letta Mbulu and Peggy Gou. Having been in the game for a little over two years, the Sydney DJ has well and truly carved her name into the dance music scene, having found herself on a number of Australian festival staples, including Splendour In The Grass, This That and Groovin’ The Moo, and securing support for Confidence Man, The Presets, Total Giovanni, DJ Seinfeld and CC:DISCO!. With a backlog of tracks filled with 4-to-the-floor beats and wacky, rare samples, Lex shows there is no sign of her slowing down for 2019, with Summer Dance thrilled to be welcoming the local legend for one last boogie. Closing out its fifth year and with three sold out shows this series, Summer Dance continues its reign as Sydney’s go to day to night summer dance party. Past headliners have included the likes of Moodyman, Gilles Peterson, Omar S, Honey Dijon, DJ EZ & Australia’s own Touch Sensitive. A staple for dance music lovers Sydney wide, the final edition is not one to sleep on, drawing out the last of summer and the warmer months with one final party to remember. The National Art School is a significant Australian visual arts education institution with origins that can be traced back to 1833. Based in the historic walls of the old Darlinghurst Gaol in the heart of Sydney, the site has seen an extraordinary history from a place of abject misery to the home of one of Australia’s most prestigious arts institutes. The National Art School offers a select number of full time programs; Bachelor of Fine Art, Bachelor of Fine Art (Honours) and Master of Fine Art, and for the community, a comprehensive range of part-time and intensive short courses. It has a rich tradition of artistic practice and well-renowned alumni, nurturing generations of artists who contribute significantly to Australian and international culture. In addition to its education programs, the N.A.S. Gallery presents various engaging and thought provoking exhibitions, events and publications, attracting thousands of visitors each year to experience the vitality of the visual arts. The National Art School’s historic venues, including the Cell Block Theatre and The Chapel, are also available for hire for commercial events, theatrical productions and private and public functions.